Posh striker Aaron Williams in action against Port Vale. Photo: Joe Dent/theposh.com. Peterborough United manager Graham Westley believes new striker Aaron Williams can better Conor Washington’s career at the ABAX Stadium. 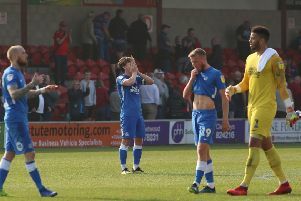 Williams scored the first goal of a Football League career that started with Walsall in January 2012 in last Saturday’s (March 12) League One home defeat at the hands of Port Vale. Former Posh striker Conor Washington in action. Photo: Joe Dent/theposh.com. The 22 year-old joined Posh from National North League side Nuneaton in January following a brief trial at the club. He was released by Walsall after eight substitute appearances in 2013 and drifted into non-league football. Washington moved to Posh from League Two side Newport County in January 2014, and improved so much under Westley, QPR paid £2.5 million to take him to the Championship two years later. Westley said: “I’ve liked Aaron since he walked through the door. He’s one hell of a good lad. “He has pace and he has good movement, and what a goal he scored on his debut. “If he keeps listening and keeps working he can become better than Conor Washington. “I don’t want to put him under great pressure, but he’ll take it in his stride. Washington has yet to score for QPR, but is expected to be named in the next Northern Ireland squad. Washington scored 33 goals in 94 appearances for Posh.